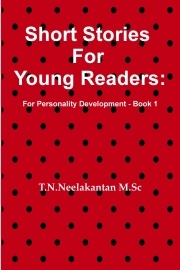 Description of "Short Stories for Young Readers: For Personality Development - Book 1"
The book is a collection of 14 short stories written by T.N.Neelakantan. The stories will help young readers develop an understanding of what makes a person successful and develop their personality. He conducts programs on Personality Development and Communication Skills and also trains people in Spoken English. He is a Motivational Speaker and has held programs in several colleges and higher secondary schools, for the benefit of college lecturers, school teachers and students. Reviews of "Short Stories for Young Readers: For Personality Development - Book 1"